Beautiful two tiered ceiling pendant light shade chandelier. 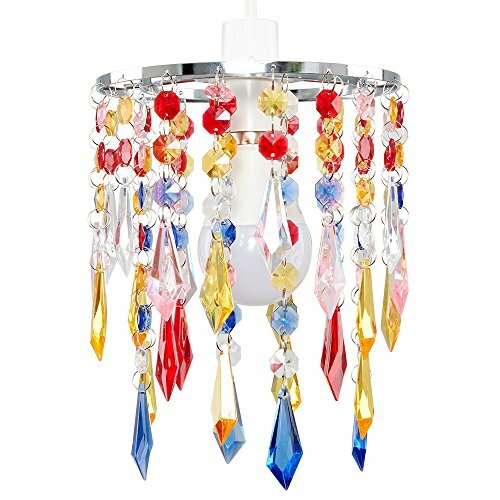 Features cascading, light-reflecting, multi-coloured acrylic jewel effect droplets, suspended from a silver chrome metal frame, which cast the light beautifully around the room. Easily fits to your standard ceiling light socket - no wiring required. With a variety of colours available, this elegant lampshade goes perfectly with almost any style of interior design. Ideal for lounges, dining rooms, bedrooms and hallways. A non electric ceiling pendant shade is a quick and economical way to update your room in seconds! 1 x 60w BC B22 GLS bulb is required - not supplied.